Frankly, MLB Network’s special 25th Anniversary commemoration of the 1986 World Series which premiered last night, could have been 7 long highlight “packages” with only my friend Bob Costas merely introducing them, and I would’ve enjoyed it. But something unexpected happened. The players who joined Costas and Tom Verducci were Mookie Wilson of the Mets, and Bruce Hurst and Calvin Schiraldi of the Red Sox. Wilson has long been a source of reflective information on the dramatic series between the Mets and Red Sox. Hurst proved himself erudite and frank – just as he was as a player, who was never an “easy” interview but always an insightful one. Several times he responded – reluctantly but bluntly – to particularly outlandish and unsupported comments about his teammates from 1986 Red Sox manager John McNamara, who seems to have settled in to an emeritus stage devoted to blaming the players for his erratic managing, especially during Game 6. Costas, Wilson, Hurst, and Verducci were fine. But Schiraldi was a revelation. He, of course, was the star-crossed Boston closer, former college teammate of Roger Clemens, and an ex-Met prospect all too familiar to his old teammates, who had struggled in the ’86 A.L. Championship Series and managed to help give back a World Series win though he retired the first two men, and had two strikes on the third, in the bottom of the final inning. It is nearly almost literally true that the last time Schiraldi was heard from publicly, he was staggering off the field at Shea Stadium, a 24-year old with his future behind him. He had seemed, at best, far from confident, and, at worst, shattered. Schiraldi would be exiled to the Cubs in 1988 and would be out of the majors in 1991. 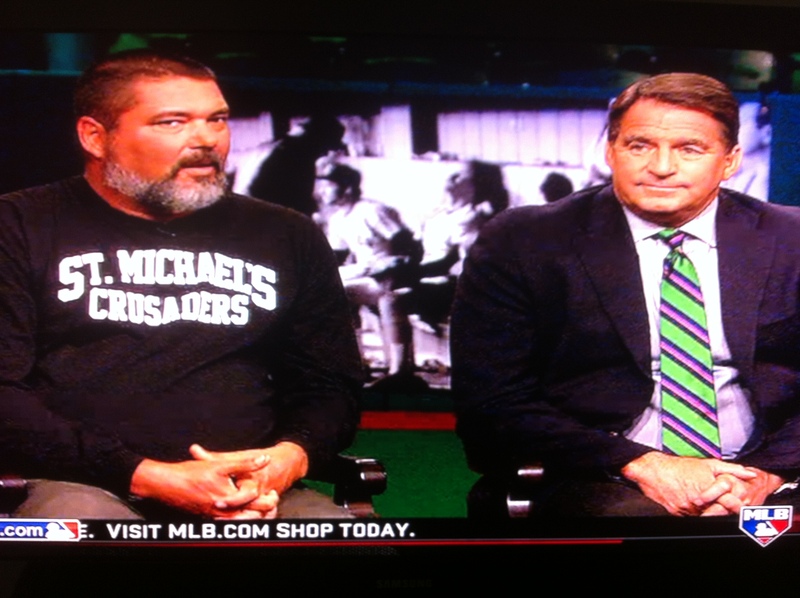 For the first hour or so of the program Schiraldi, his once-boyish face now covered in a graying beard, wearing a strange sweatshirt and clashing with the impeccably dressed Hurst, seemed terse to the point of embarrassment. There was a kind of cringe factor growing as the game-by-game recollection of the Series moved inevitably towards his nightmare in Game 6. But this time, Calvin Schiraldi starred. This is, of course, the moment during the horror film where you the viewer think the carnage is over and you’ve survived – the “placing the flowers on Carrie’s grave” moment, just before her hand shoots out of the ground to claim you. Physiologists will tell you it is not a purely psychological phenomenon. The energy and the adrenaline abate. And when it turns out Carrie is reaching out – or the manager says “Calvin, now we’ve got a two-run lead, go back out there and wrap this up” – when you reach for that energy, it’s not there – and you are on your own, and on your own against Carrie. The show’s insight could’ve ended there with Schiraldi giving an explanation (but not an excuse) for what happened during the last 0.2 of the 2.2 innings he pitched that night. But then came something transcendent. He was asked how he felt now about the game and the series and he, presumably unknowingly, defined the true value of sports. Schiraldi said he was obviously unhappy at the outcome of the game and the series, but he would not change the experience if it meant changing who that night made him become. That’s when Schiraldi revealed the meaning of his unusual sweatshirt. For more than a decade he’s been the baseball coach – and a teacher – at St Michael’s Catholic Academy in Austin. And the things he learned in the majors, particularly in Game 6 of the 1986 World Series, have formed the core of his value and coaching systems. He’s used that inning to teach kids about sports – and life. You have to hear him say it, to truly appreciate it. The MLB retrospective on the ’86 Series runs again tomorrow and Sunday afternoons at 1 PM ET. Find a way to watch, because 25 years later, Schiraldi has had an impact that merely getting the last out could never have afforded him.